We've obtained tax returns for The Second Mile charity from 1998 to present. Some disturbing tidbits in there. Easily the most disturbing is the amount of money Jerry Sandusky earned through his nonprofit organization after 1998, when at least one person affiliated with The Second Mile learned that Sandusky was under investigation for sexual misconduct. Sandusky wasn't charged in 1998, remember, but he did admit to hugging a boy while showering with him, which he further acknowledged was wrong. 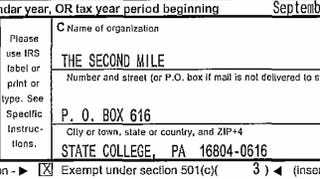 In 2001, The Second Mile started paying Sandusky an annual "consulting" fee of $57,000, according to the IRS records. The Second Mile only stopped paying Sandusky in 2009, after the charity also decided to stop Sandusky from camping out with young boys. Even without the allegations that Sandusky used the charity to find victims, this kind of gravy-ladling should make everyone sick. Think of it this way: In eight years, Jerry Sandusky made more money showing up at golf courses and steak dinners than most Americans do working every day. Also noteworthy are the salaries of the top employees at The Second Mile, who gave themselves raises almost every year, even as the economy withered. The Second Mile's president and CEO Jack Raykovitz has cleared over $1 million in direct compensation since 1998. Raykovitz's total in that span: $1,300,145. Raykovitz's right-hand-woman, Katherine Genovese, has been with the charity since 1998 and made almost as much money as her boss. Genovese's total direct compensation since then: $912,563. The other longtime employee of the charity is Henry Lesch, who started with Genovese. He made $793,667 in the same span. Sandusky's name disappears from the 2010 tax return, which covers a period of time directly after the charity decided to keep its founder away from kids. The way Sandusky depicted it, he was "retiring" after years of dedicated service to Pennsylvania's youth. A local paper published a glowing story about him. Sandusky also wrote a resignation letter in which he said he was stepping down to "devote more time to my family and personal matters." The charity removed the letter from its website at some point, but it lingered in a Google search cache. Sandusky wrapped up his letter with the following statement: "I celebrate the power of caring adults to change children's lives and ... take the next step in my own life." The whole thing is below (click to enlarge). We'll have more from the tax returns later today. UPDATE (9:10 p.m.): We have learned that Raykovitz and Genovese are married. Their combined compensation since 1998 is $2,212,708.